I have never liked bread pudding because of the wet sponge texture but when I saw this recipe from MiMi Bakery House, I decided to give it a try. Simple steps and I have added chocolate chips and almond flakes. Overall, the texture wasn't as bad as I thought but I felt if it was sweeter it would be perfect! Now, I can make this if I have bread that are going to expire. 1. Cook diced apple with butter under low heat. Add sugar and cook for awhile. 2. Beat eggs, milk and yogurt until well combined. Add in sugar and mix until sugar dissolved. 3. 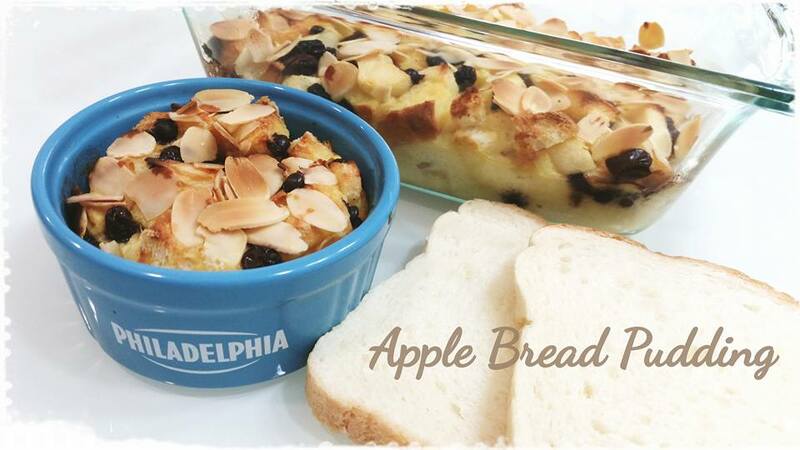 Put apples, bread, raisins, chocolate chips into baking tray or ramekins. 4. Pour egg mixture over and spread almond flakes on top. 5. Baked 190 Deg C for 30-40mins.